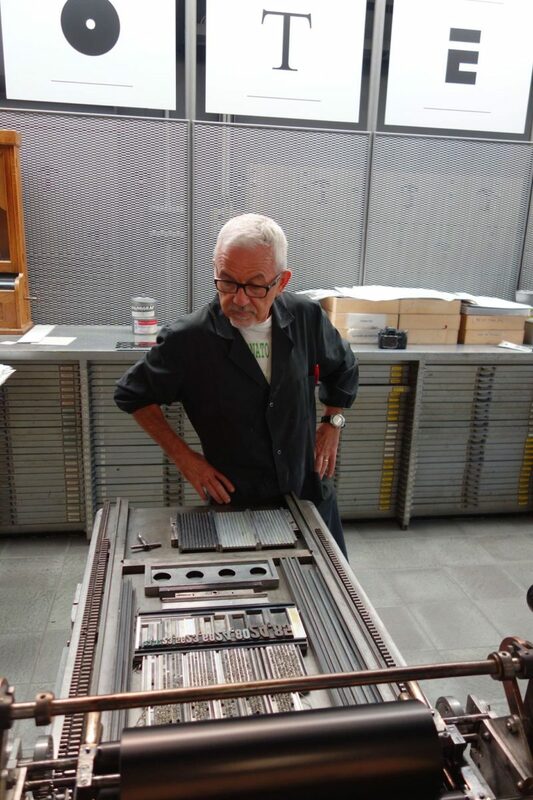 At the end of September 2017, a group of friends from the letterpress world met up in Cornuda (Italy) to work together at the Tipoteca Italiana Fundazione. During the week, I kept a diary that I posted on social media. Here is a slightly edited version of it. Most of us spent the day travelling to Tipoteca and it was only in the evening – during our first meal at the restaurant Guarnier – that we started making our plans. We spent the morning discussing, sketching and meeting with Silvio Antiga, the founder of the museum. After our lunch we set to work. Our plan is to print a small folded booklet, 10 panels, with on the reverse side a poster. We advanced well on the poster and will start printing the first run of the 5 colours on Wednesday morning. 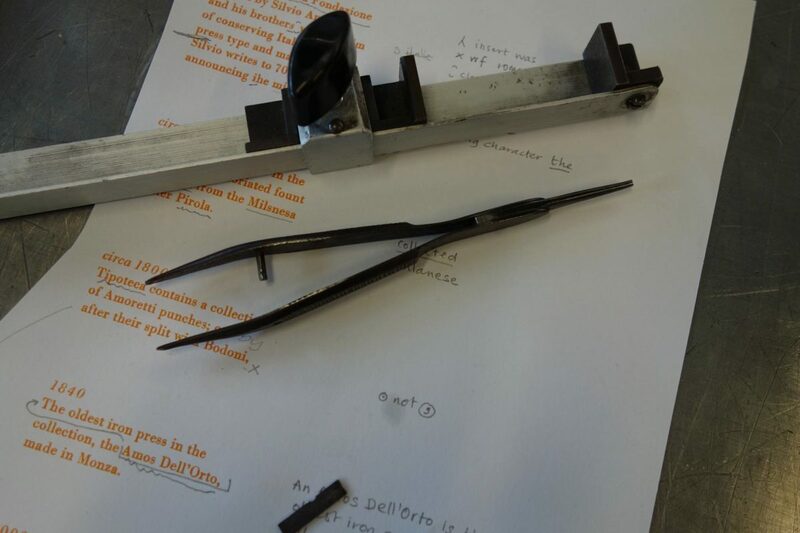 We will probably end up with a team printing and another team starting the typesetting of the ten panels. Michael will hopefully arrive as well, as he had to deal with an inflammation of the ear. 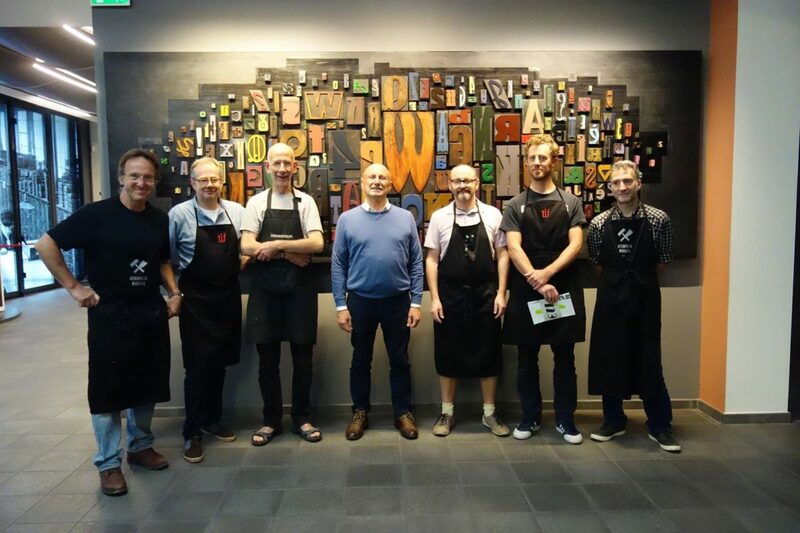 Our team will then be complete and consist of John Christopher from Flowers and Fleurons; Richard Ardagh and Graham Bignell from New North Press, both in the UK; Stephane de Schrevel from Belgium; Michael Karner from Austria and Sander Pinkse and myself from the Netherlands. Michael Karner arrived on in the morning – got quickly introduced to our group – and within half an hour was happily setting away some texts for the captions. 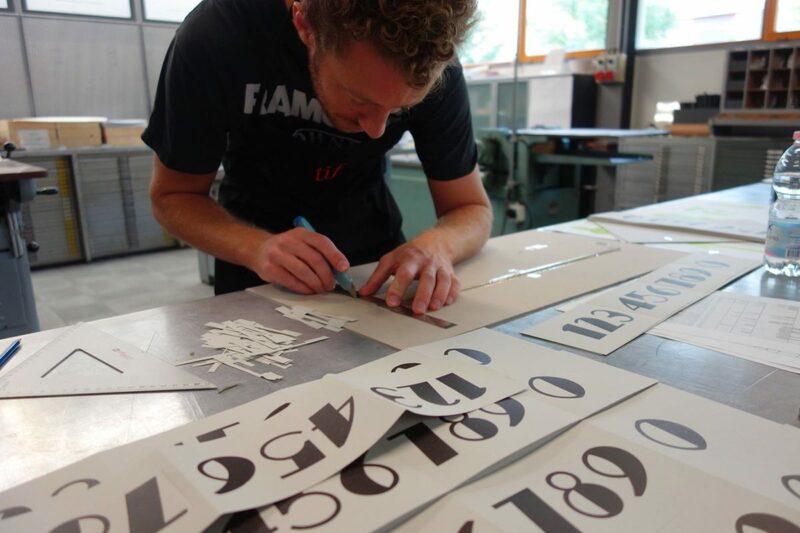 One half of the team was preparing the forme, the other half was busy on the FAG test press printing the oversized wooden ‘0’ (70 cm in height!). It actually consists of two halves, each measuring 35 cm. Our print run is 400, and this meant that speed had to be build up. The forme with the numbers is taking shape, some proofs were pulled and a rough paste up made as well. At the end of the day Sandro Berra treated us to a visit to the huge warehouse where more treasures are being stored. Stacks and stacks of wood type, all neatly packed and labelled, printing presses and other printing equipment that has been cleaned and restored sits there. A workshop with all the equipment to repair and restore is at the disposal of the team that takes care of it. 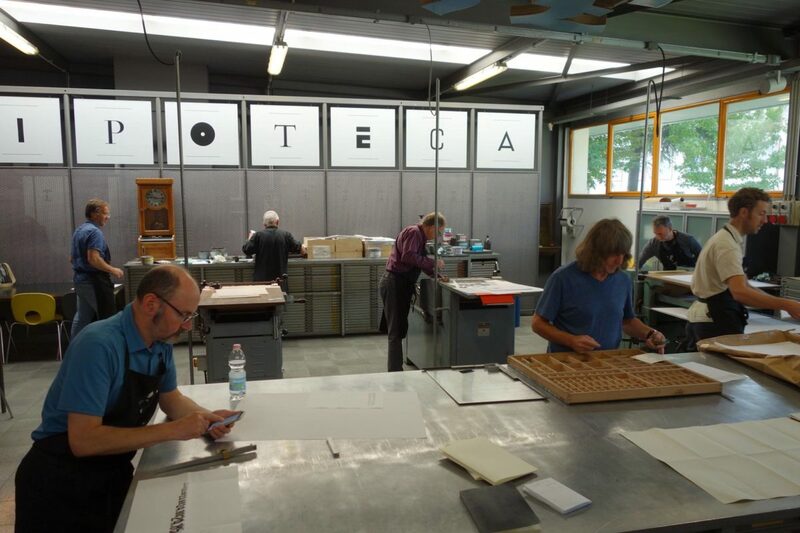 Upon arrival at the Tipoteca Italiana the two groups set immediately to work. On the poster side of our publication, a pistachio green colour had to be printed. 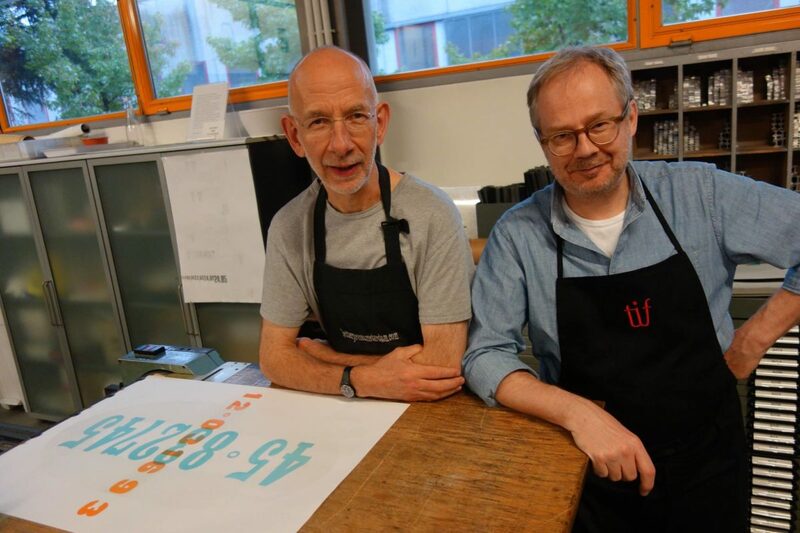 Graham Bignell mixed us a nice amount of ink and soon the press was running. On the central island, text was being set, proofed and corrected. After lunch across the road at the Corderie, Leonardo took us to the library, where we were able to handle some books printed by Aldus Manutius; the Manuele Typographico by Giambattista Bodoni and as a very rare copy of a publication by Bodoni, set in Fournier types. John Christopher became quite ecstatic seeing all these beauties. 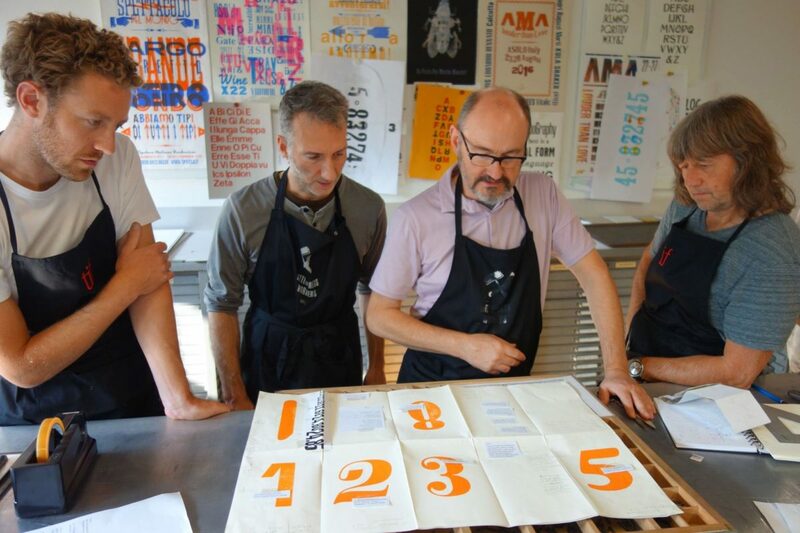 We finished the day with building the forme for the black texts that will be printed on tomorrow. As mentioned before, Saturday was our last day at Tipoteca Italiana, but not our last day in Italy. The seven ‘Gentlemen of Cornuda’ travelled to Treviso, where they wandered around, visited an exhibition – fin de siècle posters – and had lunch with Sandro Berra, his partner Ferena Lenzi and her daughter Marta, before returning home… It has been a fantastic week, with hard work, good food and wine, long conversations and laughter and deeper friendships!